Chalkbrood, a disease that can kill honeybee larvae, is caused by a fungus, Ascophaera apis. It occurs worldwide, but is most serious in some warmer climates. You can help protect against chalkbrood with Apiguard, and strengthen colonies with VitaFeed Gold. Chalkbrood kills larvae which then shrink and dry to form a white or grey-black chalk-like mummy. Frames with a high level of chalkbrood can even be heard to rattle when shaken. Holes in cell cappings are another clue before the mummies are seen: the nurse bees cut holes in the cappings to try to remove the mummy. In infected colonies, mummies can be found near the hive entrance after being ejected during hive cleaning. Spores of the chalkbrood fungus in brood food are ingested by the bee larva and germinate in their hindgut. Infection can also occur by growth of the fungus through the cuticle. After the cells are capped, mycelia develop from the fungal spores and eventually engulf the entire larva, giving it a white fluffy cotton-wool appearance. White mummies result from infection with only one sexual type of A. apis while the grey-black mummies indicate invasion by both sexual types. Larvae are most susceptible to infection at 3-4 days of age and infected larvae die within 2 days of cell capping. Chalkbrood spores are often transferred in contaminated pollen or on drifting or robbing bees from contaminated hives. The incidence and spread of chalkbrood infection is difficult to predict, but if conditions are right for chalkbrood, colonies can be devastated in a very short time. No commercial treatment specifically targeting chalkbrood is currently available, but Apiguard has been shown to be effective. As ever, good beekeeping practices can help prevent or reduce the impact of chalkbrood and general stress factors should be minimised. 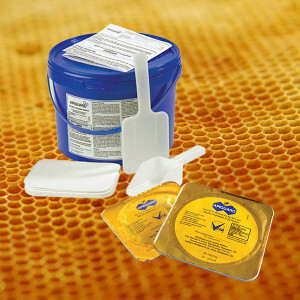 Hives should be kept well ventilated and free from damp, with plenty of food. Where persistent chalkbrood infections occur re-queening is advisable. Workers showing a high level of hygienic behaviour are less prone to chalkbrood infection.